Just as a surgeon learns to take out an appendix, an accountant learns how to prepare financial statements, a plumber learns how to fix a leak, electricians learn how to wire a house … a manager can learn how to build a high-performing and agile organisation that is suited to its purpose. All you need is a bit of theoretical knowledge, some non-negotiable rules, and a process to apply these. Ask yourself: "have I been trained to build and operate a complex health system"? If the answer is "no", then you owe it to yourself, your colleagues, and most of all your patients and community, to learn how to do it. It is a complete piece of work, it covers all the things you need to know. 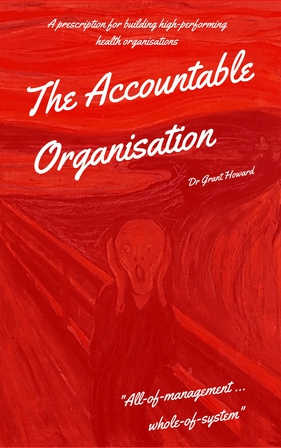 If you choose to download the book you will be asked to complete a form so that we can keep track of how far The Accountable Organisation has been disseminated.